The Dark Seducer is one of my favorite creature cards in the entire Isle of Madness deck because it is one of the most powerful turnaround cards available in the expansion. 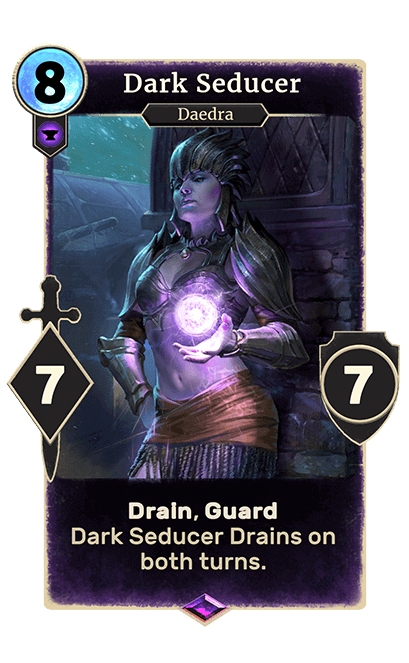 The Dark Seducer is a guard that drains on both turns, meaning if you play it as a saving grace when your health is dangerously low, you can usually turn the whole game around and end up on top. It costs 8 magicka to use, but has 7 power and 7 health. Because it is a guard and any enemy creature in the lane will have to target it, it’s usually good to assign items to improve its defense and keep it play for as long as possible. 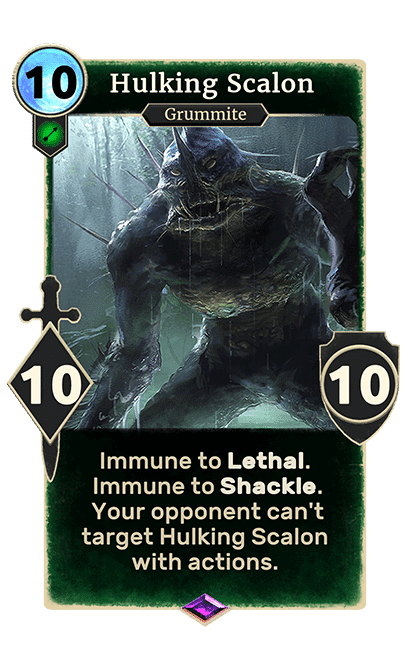 This hefty gargantuan of a card is one of the most powerful forces in the deck, and while it is very costly at a whopping 10 magicka points, it is also very difficult to take out once played. The Hulking Scalon has 10 power and 10 health, and is also immune to lethal and shackle attacks. In addition to this immunity, it also cannot be targeted by actions, making it a very defensible creature that can inflict a heavy amount of damage. 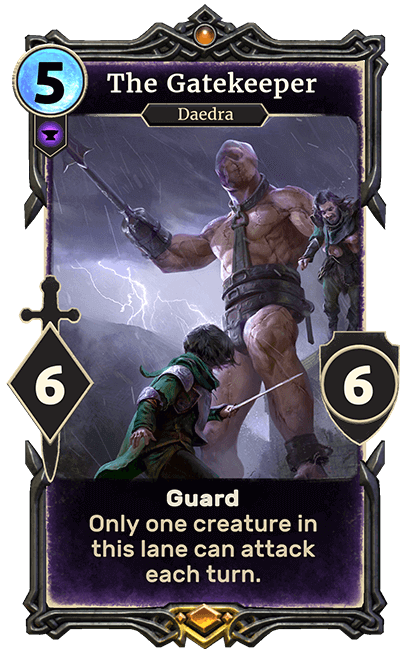 An Honorable Mention goes out to the Grummite Magus, which is a guard that forces the opponent to discard the highest cost action in their hand. It costs 7 magicka and has 5 power and 5 health, and is a pretty decent card that often comes in handy. The Isle of Madness expansion introduces two new lane mechanics called Mania and Dementia. A Dementia lane deals damage to your opponent if you control the most powerful creature, and a Mania lane allows you to draw a card if you possess the character with the highest health. There are two Legendary cards in the deck that are almost identical and can convert an existing lane to either Dementia or Mania, and the strength and usefulness of each type of lane depends solely on your preferences. I found the Dementia lane to be preferable, as drawing cards is not a mechanic I always pine after and I find myself playing characters with the strongest power more often than those with the highest amount of health. Syl, Duchess of Dementia is a card that converts a lane to Dementia, with 7 power and 6 health. 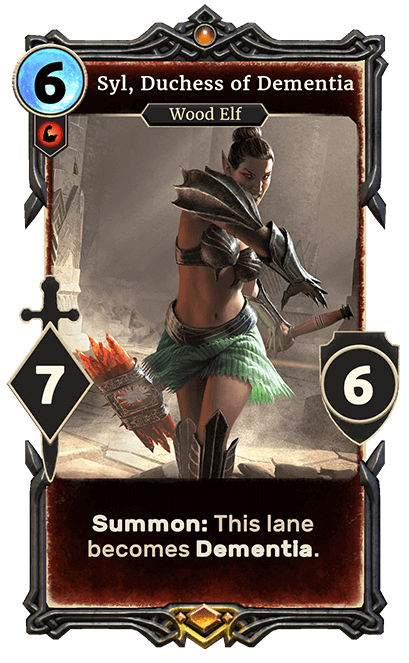 It costs 6 magicka to use, but should be played with caution as there is a high risk that you will be the one taking damage if you do not have strong cards in play. For this reason, her counterpart card, Thadon, Duke of Mania, can often be a much safer bet. The Gatekeeper is an excellent, low-cost way to roadblock your opponent from dealing too much damage. With a cost of 5 magicka, 6 power and 6 health, this guard allows only one creature in its respective lane to attack each turn. It’s useful in the beginning if you need a few turns to get your bearings, and especially useful later in a match if used in a lane where your enemy has played multiple strong creatures. 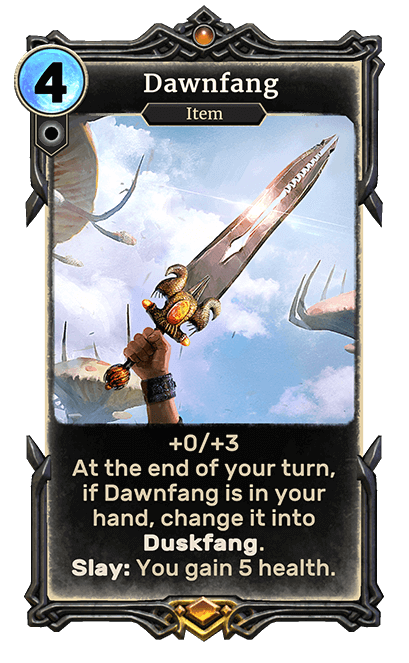 Dawnfang is an item that adds +3 health to a creature it is assigned to, and should it stay in your hand at the end of a turn, it converts to Duskfang. Duskfang, its counterpart card, adds +3 power rather than +3 health. Dawnfang has the slay ability that grants you 5 health, while Duskfang grants you the ability to draw a card. Both cost only 4 magicka to use, and because they can each transform into one another if they survive a turn, there are multiple options for how you can utilize this useful card. Another Honorable Mention goes to Luzrah gro-Shar, whose low cost of 2 magicka combined with its ability give both Luzrah and any summoned creature with a cost of 6 or more a +2/+2 modifier surely makes it a promising contender. There were so many great cards in the Isle of Madness deck, and it was extremely tough to choose just 10 of my favorites. What are some of your favorite new cards in the expansion? What did I miss? Let us know in the comments below, and for more awesome video game coverage, keep up with us on Facebook, Twitter, and Youtube!